Dr. James Turner Barclay was sent to Jerusalem by the American Christian Missionary Society in 1851 as a medical and evangelistic missionary. During his first trip he stayed until 1854 and returned for a second stint from 1858 to 1861. Barclay was active in medical work, treating more than 2,000 cases of malaria during his first year in the city. 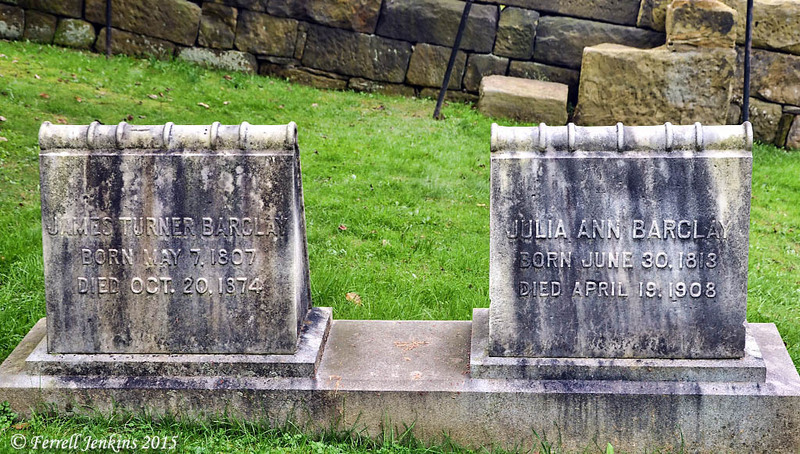 Grave stone of Dr. James T. Barclay, and his wife Julia, in the Campbell Cemetery at Bethany, West Virginia. Photo by Ferrell Jenkins. Barclay wrote a book in 1858 about the city of Jerusalem under the title The City of the Great King; or, Jerusalem As It Was, As It Is, and As It Is To Be. In it he tells about some of his explorations in and around the Old City. In a section dealing with nether Jerusalem he discusses the discovery of what is commonly called Solomon’s Quarry. Dr. J. T. Barclay inserts an article written by Dr. R. G. Barclay, his oldest son, about the exploration and their conviction that this was the quarry from which stone for the temple was taken. This, without doubt, is the very magazine from which much of the Temple rock was hewn—the pit from which was taken the material for the silent growth of the Temple (The City of the Great King; Or, Jerusalem as It Was, as It Is, and as It Is to Be. pp. 462-463). One of my graduate professors, Dr. Jack P. Lewis, wrote a series of articles about nineteenth century explorers of the Bible Lands in the Biblical Archaeologist (and perhaps some other journals). His article about Dr. Barclay was published in 1988 (Vol. 51). The biographical portraits have been collected in Early Explorers of Bible Lands , published by Abilene Christian University Press in 2013. Entrance to Solomon’s Quarries on Sultan Suleiman Street about a block east of Damascus Gate. 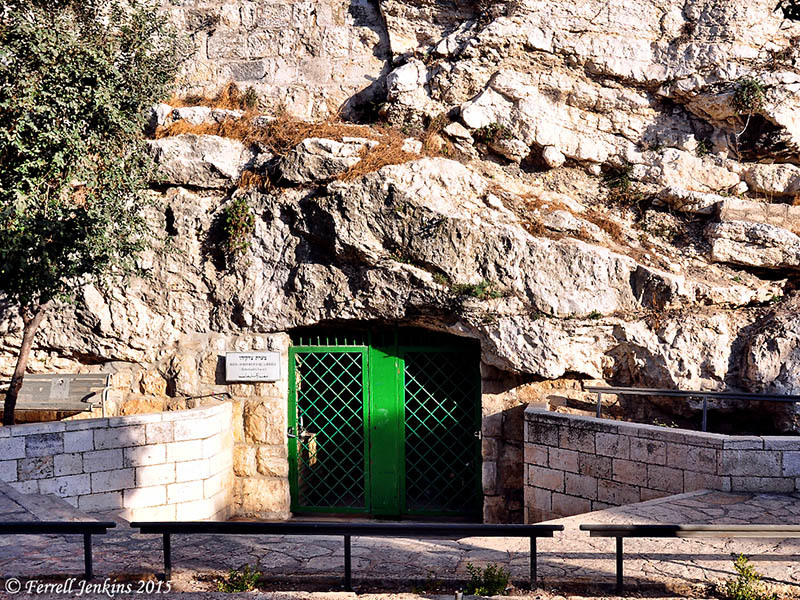 The sign to the left of the door identifies the place as King Solomon’s Quarries (Zedekiah’s Cave). Photo by Ferrell Jenkins. Lewis provides a brief summary of Barclay’s discovery of Solomon’s Quarries (also called Zedekiah’s Cave). Barclay claimed credit for discovering the cavern under the north wall of the city near the Damascus Gate. Popularly known as Solomon’s Quarries, this area is called Zedekiah’s Grotto by Israelis in honor of the last king of Judah. According to legend, Zedekiah is said to have fled Jerusalem through this cavern upon the Babylonian conquest of the city in 587 BCE J. J. Simons, who has identified the area as the Royal Caverns mentioned by Josephus (The Jewish War, book 5, chapter 4, paragraph 2; see Thackeray 1961: 245) estimated that 350,000 cubic meters of stone were quarried there (Simons 1952: 13). When Barclay heard rumors of a cavern under the north wall, he tried to locate an entrance to it. He and his two sons conducted their search at night in order to avoid detection by Moslems, who would have opposed such an expedition. The group made their way into the blocked cavern through a hole started by the Barclay dog when it was digging for bones. Once inside the cave they discovered Hebrew and Arabic inscriptions that were too effaced to be deciphered (Barclay 1858: 461–62; Johnson 1858: 98–100). They also found crosses carved into the walls, indicating the presence of Christian pilgrims from an earlier period. The Barclays were disappointed that they found no outlet to the Haram or the Antonia fortress but they were impressed by the vast piles of blocks and chippings over which they had to clamber and were convinced they had discovered the quarries from which the stones for Solomon’s Temple were cut. In a future post we will include some photos of the interior of the Quarries. For more about Dr. James Turner Barclay and his work, see TheRestorationMovement website here. This entry was posted in Archaeology, Bible Lands, Bible Places, Bible Study, Books, Israel, Old Testament, Photography, Restoration Movement, Travel and tagged Dr. James Turner Barclay, James Turner Barclay, Temple. Bookmark the permalink. I have just re-read my thought question (above) from 2-1/2 years ago! On reflection, I suspect that Jesus’ utterance most likely alludes to David, who captured the Jebusite city ca. 1,000 BC and established it as the new capital of the Israelite kingdom. Who else would qualify as “the great King” of Jerusalem — except perhaps Jesus himself? (The impious Herod had died some 30 years before and — despite creating Jerusalem’s most monumental architecture of that day, including the vast Temple complex — is probably not the one referred to.) Can anyone find another solid interpretation, perhaps from a commentary? Thanks for an interesting post! The title of Barclay’s book, City of the Great King, is taken directly from Matt. 5.35 where, in the Sermon on the Mount, Jesus lists things by which one should not swear: “neither by Jerusalem; for it is the city of the great King.” But who, in Jesus’ utterance, is being referred to as “the great king”? In historical terms, the country at that time was ruled by a Roman procurator, Pontius Pilate (26-36 AD). It’s a question to which I do not have a good answer. Anyone?